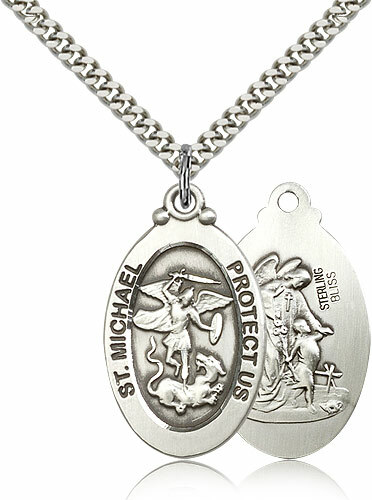 Shop for Saint Michael medal for men or women and get Free Shipping and Returns. Browse the latest styles and choose a perfect St Michael necklace for someone in military or police force as He is the patron saint of those who serve and put their lives in danger. According to the book of Revelation (20:1-3), the Archangel Michael won a battle with forces of Satan banishing him to hell. Saint Michael is the Prince of all Archangels and his likeness is one of the most sought after in religious medals. He exemplifies strength, tanancity and dedication to the Lord. He is the defender and protector of the faith and symbolizes victory of good over evil. The Catholic church venerates St Michael, Gabriel and Raphael by name. He has been designated as a guardian of the Church. He is the angel of death, assisting souls on their journey to heaven for judgment. Get a special protection by praying to Saint Michael while wearing a pendant necklace with His image.